Kanan and Hera’s relationship is a focus on the Star Wars Rebels season 4 Blu-ray. The final season of Star Wars Rebels hits Blu-ray Tuesday and with it, of course, will be a nice selection of special features. io9 is excited to debut this lovely clip from the set, which focuses on Hera and Kanan. Specifically, the course of their relationship during the animated series. 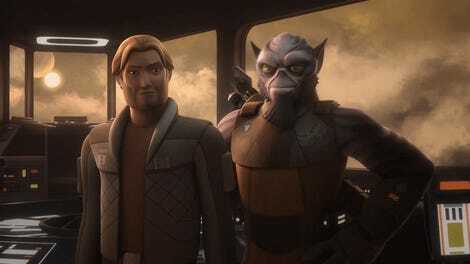 The clip—part of a larger feature—talks about how Hera and Kanan’s (voiced by Vanessa Marshall and Freddie Prinze Jr.) relationship was kind of drawn out over four seasons, solidified at the absolute worst time, but had an adorable, excellent, conclusion. Check it out. The fact that Kanan and Hera had a son, Jacen, was obviously more than just a nice ending to their relationship. Since his father was a Jedi, it seems more than likely he could be a fairly important person in a post-Empire Star Wars universe. When or how we may see that play out, whether in the movies or Star Wars Resistance, remains to be seen. But the fact this is acknowledged on an official capacity. Star Wars Rebels season 4 hits Blu-ray Tuesday. We’ll have more then.